There are few things scarier to a new mom than when her baby has a fever. Is it because of teething? Is he sick? Was it her shots? Is it serious? PANIC! That's why, when it comes to taking baby's temperature, it had better be easy and it had better work. You can always use your wrist or your lips to get a primary gauge of the situation, but if junior is warm, it's time to break out the equipment. There are a few different style of thermometer, and each have their pros and cons. Here are a few I've tried, along with some new technology that I'm excited to look into! This model is a step up from the classic mercury model you worried about being inserted into the wrong end as a child. It is simple, and effective, if you can make your child sit still. Taking a baby's temperature under their tongue, by holding it under their arm pit, or -ahem- that other way, is difficult, especially if your child is mobile. This also means it might not be the most accurate method when it really counts. Still, because they are cheap, portable, and work most of the time, it's not a bad idea to have one in your diaper bag. These things are quick and accurate. 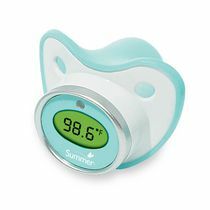 Your son or daughter might not like it, but it's over with so fast, that they don't have enough time to protest before you have an accurate temperature. They have a lot of features, as well. 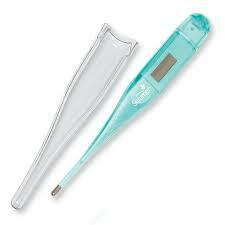 Most give readings in Celsius or Fahrenheit, allow you to record previous readings, and glow red to indicate a fever. They are a bit bulky, however. It's not exactly the kind of thing you want to add to your already-stuffed bag. Plus, the battery power does have a tendency to drain quickly, depending on the price point of your unit. Especially if a certain baby thinks the beep is funny, and plays with it during a diaper change. Sigh. If your baby takes a soother, you might be inclined to choose this (seemingly convenient) method. There isn't a large selection in terms of brands, but they are all small and easy to use, with a large temperature display, and a cover to keep it clean. Heck, it might even serve a back up if your normal pacifier got left at home! The problem is, children are picky. Just as not all bottles work for all latches, not all soother shapes please baby. My son didn't like this style, so I found it ultimately harder than the above two styles. OK, I've never tried this style of thermometer, but they are so darn cute I just had to mention them! 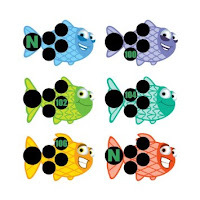 The ones pictured are called Fever Fish, and are just one style of measuring temperature by actually applying a sticker to your child's forehead. 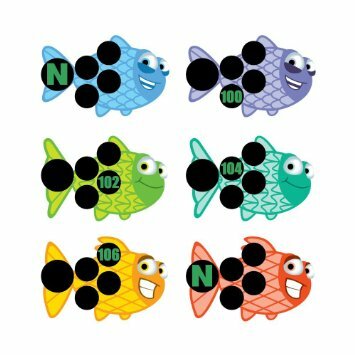 I'm not sure all children would like the idea of a sticker on their face, I have a hard enough time keeping a hat on my son, but maybe school aged children would enjoy it, especially if it was a character or animal they liked. The same sort of idea as branded bandages. 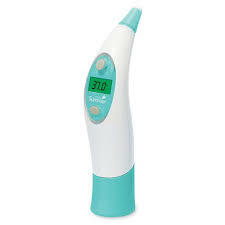 What's your favorite way to take take baby's temperature? Have any comforting sick day tricks? We want to hear about it! Join the discussion on Facebook!